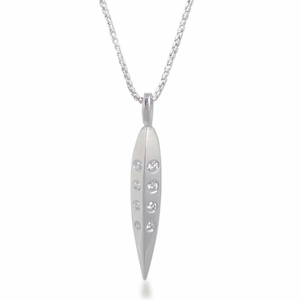 20 diamonds have been handset within this unique pendant. Perfect for celebrating 20 years! So it's great for a very special 20th birthday gift or as a meaningful 20th wedding anniversary gift. It's an original 5 sided pendant, with 4 diamonds per side. The pendant is made of sterling silver and is 0.2" across and 1" long. Chain included. The diamonds total 0.43 carats. They are high quality stones, brilliant and round cut. They are SI-1 to VS-2 in clarity and F to G in coloring.